(Nanowerk News) Researchers at the Institute of Bioengineering and Nanotechnology (IBN) have successfully generated human kidney cells from human embryonic stem cells in vitro ("Human embryonic stem cells differentiate into functional renal proximal tubular–like cells"). Specifically, they produced the renal cells under artificial conditions in the lab without using animals or organs. This has not been possible until now. Kidney cells derived from human embryonic stem cells. 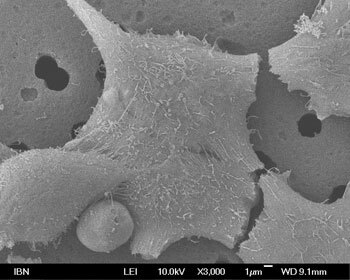 The cells were imaged by scanning electron microscopy. At present, human kidney cells are extracted directly from human kidney samples. However, this method is not efficient because such samples are limited, and the extracted cells die after a few cell divisions in the petri dish. Also, cells obtained from different samples would display variable features, depending on age, gender, health status and other conditions of the donor. Therefore, cells that have been isolated from human samples are of limited suitability for research and applications in industry and translational medicine, which require large cell numbers. An alternative approach is to use human renal cell lines that have been rendered immortal, i.e. they can be reproduced indefinitely in the lab. However, such cells may not be used in many applications due to safety issues, and their functional features have usually been changed so profoundly that they may no longer be useful toward predicting cell behavior in the human body. IBN’s technique, on the other hand, enables human embryonic stem cells to differentiate into renal proximal tubular-like cells. This particular kidney cell type plays an important role in kidney disease-related processes and drug clearance. Results showed that the renal proximal tubular-like cells generated by IBN were similar to the renal proximal tubular cells isolated from fresh human kidney samples. For example, they displayed very similar gene and protein expression patterns. Also, since human embryonic stem cells may grow indefinitely in cell culture, the IBN researchers have discovered a potentially unlimited source of human kidney cells. The IBN researchers have tested the renal cells they generated in in vitro nephrotoxicology models developed by the Institute, and have obtained very promising test results. They welcome industry partners to collaborate with IBN on commercializing this technology. IBN has recently received a grant from A*STAR’s Joint Council Office Development Program to further develop predictive in vitro models for liver- and kidney-specific toxicity. This project will be conducted in collaboration with the Experimental Therapeutics Centre, the Bioinformatics Institute and the National University Health System.